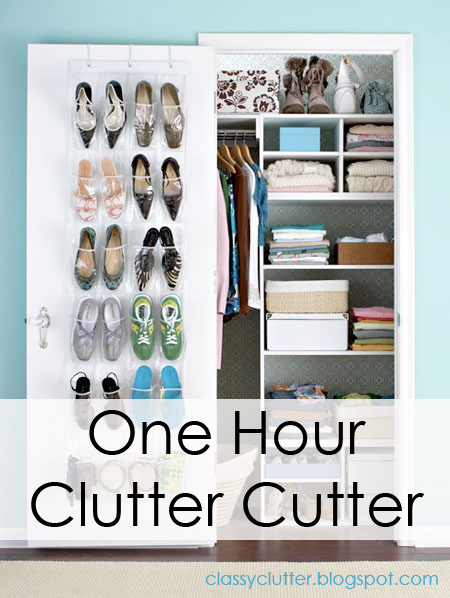 Here are 5 ways for you to spend the next hour cutting the clutter in your home! 1. Clothes closets: Grab a garbage bag and go through your closet! Grab anything you haven't worn in the last 6 months and donate it! (Except seasonal items of course!) Remember the golden rule for clutterless closets, one item in, one item out! Grab that garbage bag and put it in your car to donate it next time you're running errands! 2. Pantry and Refrigerator: Take 10 minutes and throw out any expired products! Consolidate like items and toss things that have simply been in there too long! I know I have salad dressings in my fridge that we will never eat! I also have a couple bottles of BBQ sauce that can be combined into one jar! 3. Bathroom: Throw out old or unused products! Toothpaste, empty floss, old makeup, etc. Replace your families toothbrushes every 2-3 months or after someone in your family is sick! Restock toilet paper and bath towels. I always like to finish the bathroom off with wiping down the mirrors! It gives the room a "clean" look even if you haven't scrubbed the room lately! 4. Cleaning cabinet: Tidy up the cleaning cabinet by placing all your cleaning supplies together in a bin and keep your cleaning gloves, sponges, and brushes together. Instead of tossing old cleaning spray bottles, add water to them and store them for cleaning water in your emergency storage. Make sure to label them so they are used properly! 5. Kitchen: Open up your cabinets, donate the items you don't use! Do you have 2 ice cream scoops? 3 different sets of measuring cups? You don't need multiples of everything unless you're a master baker! Which I am NOT! :) If you have lids that don't go to anything, don't even donate them, recycle them! Now you know exactly what to do at nap time! Work quickly and efficiently and you will LOVE the results! Follow us on Facebook here... and on pinterest here and here.